Our basic service option, the Tune Up is built to get your bike back to good working condition. If you feel that it's not working the way it should (or you can't remember the last time you had a tune up) bring it in and talk to us about what you've been hearing or feeling and we'll get it checked out. Sometimes, you're just riding along and things happen. Any sort of damage or accident is a great time to have the rest of your bike checked out. The Tune Up goes through the major systems of the bike and resets things to their proper settings. 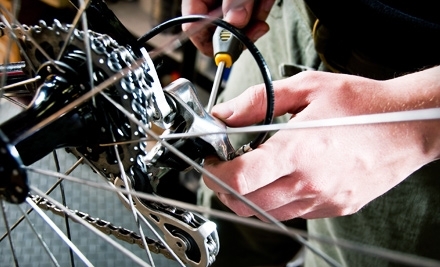 If your bike isn't shifting anymore, or your brakes are squeeking and hitting the rim, we will take care of that, as well as checking that everything is properly tightened down.